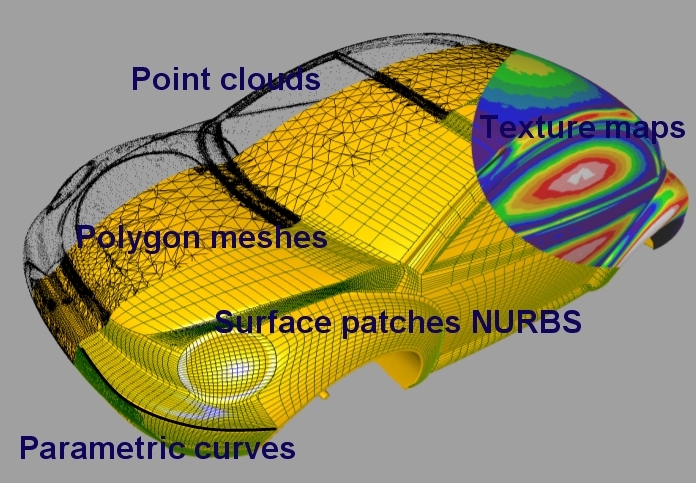 This course is designed to teach students the fundamental techniques of digital shape modeling and the various geometric representations used to capture shape. The course will feature guest lectures by industrial designers and shape modelers on the approaches used in current software to go from visual concept to digital shape. As a graduate course in the Department of Computer Science, a solid background in computer science and computer graphics is expected and an artistic sense desirable. The course will attempt to strike a balance between art and science and we are committed to make the lectures and projects interesting and challenging to all. The course format is 13 weeks of one meeting a week. Roughly 3/4 the meetings will be lectures and the rest will involve paper presentations by the students. The students will be graded on their technical and creative contribution to a modeling project (done in groups of 3 or less) that will account for 40% of the grade. A project report will account for 10% of the mark. Maya will be used as the platform for a small assignment to design and digitally model a functional industrial design object worth 30%. The remaining 20% will be based on the presentation of a research paper in class.